For the past 30 years Allopurinol has been used to combat gout. Allopurinol prevents the release of a substance called xanthine oxidise which aids in the creation of uric acid, or commonly known as a uric acid blocker. 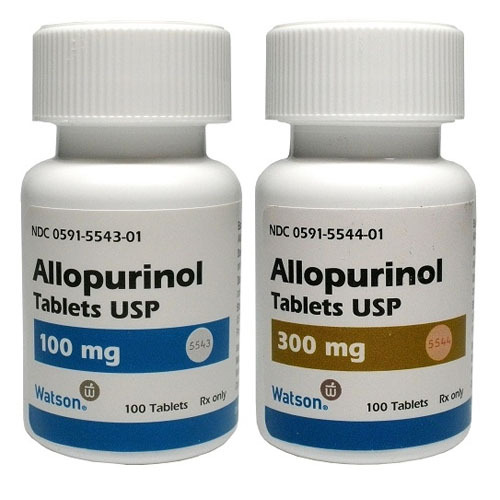 Allopurinol can also be used to control frequent gout attacks, help reduce tophi ( clumps of uric acid that crystallize and can appear on the ear lobe or on the elbows and hands in a lump form )This drug is also used for people with uric acid kidney stones and poor kidney function. gout the dosage is around the 400-600mg per day. have around the 10mg per day divided up into smaller dosages. Women who are pregnant should not take this drug as the fetus can be effected. small dosage can extremely effect new born babies. It is also used to decrease the uric acid levels in the blood and urine, and has also been used successfully in the treatment of uric acid levels in patients who are under chemotherapy treatments for leukemia, and tumor lysis syndrome in cancer patients. It is also not recommended for people who are have hemochromatosis or too much iron in their body. are gone, but if using the drug before a gout attack occurs then you can continue to take it. helps stop or block inflammation, or they can prescribe low dose NSAIDs. Can effect blood thinner drugs such as warfarin and also cause bleeding with this drug. Also known to cause kidney and bone marrow damage. also issued with a warning for doctors prescribing this drug. Always seek medical advice before taking any drug or herb for Gout. Have A Great Story About your Gout and how you treat it? Feel free to write about your Gout suffering and how you manage your Gout attacks. This is a learning curve for all of us, so the more personal experiences the better for all of us to understand this affliction.